On Sunday's card I cut a window from a Smoky Slate layer with the largest of the Lots of Labels dies and I promised to share what happened to the piece from the centre...... here it is! The base card is Early Espresso and I added a layer of Soft Sky. I cut some Smoky Slate and Basic Gray oddments with dies from the Seasonal Layers Thinlits and Bouquet Bunch Framelits and adhered all but one to the label shape. I tore a scrap of Whisper White cardstock into a snowy, hilly terrain and trimmed the end with the largest Lots of Labels die. TIP: To make it easier to tear the hill shape, "draw" the tear line with a small wet paintbrush. Leave it for a short time to soak into the card and then gently tear. With the white piece glued on top of the bottom part of the label, I then adhered the last tree shape on top of the white. I cut the reindeer from the Santa's Sleigh dies with Early Espresso cardstock and trimmed off the antlers and tail. I then cut the top part of the reindeer with Crumb Cake cardstock and adhered this behind the Early Espresso so that the Crumb Cake antlers and tail show. I then glued the reindeer to the card. I stamped the banner from Seasonal Bells with Archival Black ink and cut it out with the coordinating die in the Bunch of Banners set. 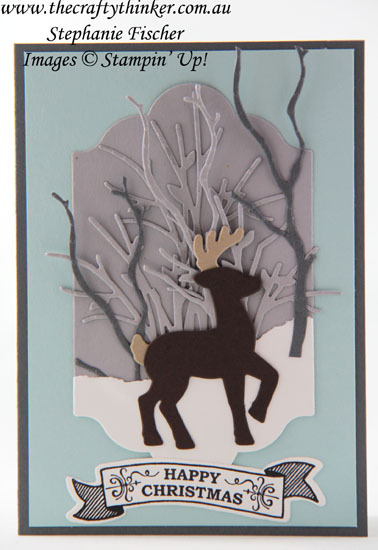 On Friday I'll share what happened to the negative space left over from cutting out the Early Espresso reindeer!